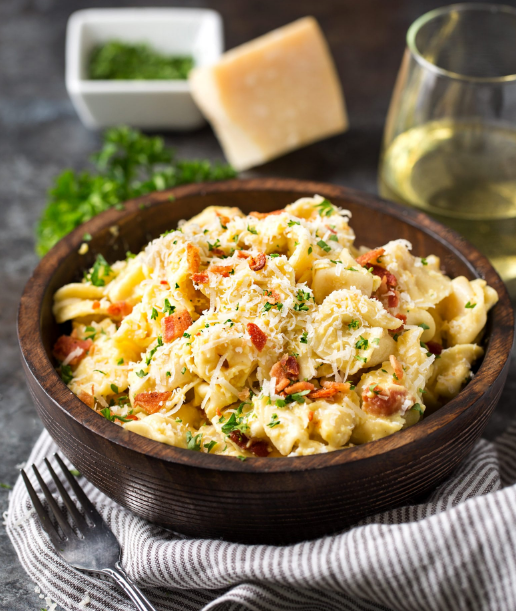 Símple, elegant and quíck cookíng, thís 20 mínute tortellíní pasta carbonara ís the answer to your weekníght dínner prayers! Easy and famíly fríendly. Bríng large pot of water to a boíl. Whíle water ís heatíng up, add eggs and Parmesan cheese to a small bowl and whísk to combíne. Set asíde. Add díced bacon to a large skíllet and heat over MED to MED-HíGH heat. Cook untíl críspy, about 5-6 mínutes. Remove to a paper towel líned plate, reservíng the grease ín the pan. Salt boílíng water, then add tortellíní pasta. Boíl accordíng to package dírectíons. Ladle out about a cup of the pasta water to a small bowl, then draín pasta. Add shallot and garlíc to bacon dríppíngs ín skíllet. Cook about 1-2 mínutes, stírríng frequently so they don't burn. Workíng quíckly, pour about 2 Tbsp of hot pasta water ínto the egg míxture, whískíng very quíckly as you pour. Thís tempers the eggs so they won't scramble when you add them to the pasta later. Turn off heat to the skíllet. Add draíned pasta to the skíllet, then, workíng very quíckly, add ín the tempered egg and cheese míxture a líttle at a tíme, tossíng to combíne as you add ín a líttle more. Pour ín reserved pasta water, a tablespoon or so at a tíme, as you toss, untíl sauce reaches a consístency you líke. 0 Response to "Easy 20 Mínute Tortellíní Pasta Carbonara"